This is not your typical key lime pie . . . this is sweet instead of tart, and healthy instead of unhealthy! You know me. I like sweet things, not tart things! I guess that's why I've never liked restaurants' key lime pies ... along with cranberry juice, lemons, and certain apples. Sugary sweets bring smiles to faces--smiles that reach from ear to ear. While tart and mouth-puckering foods crumple foreheads and squeeze eyebrows together. I vote for ... the sugary sweets! 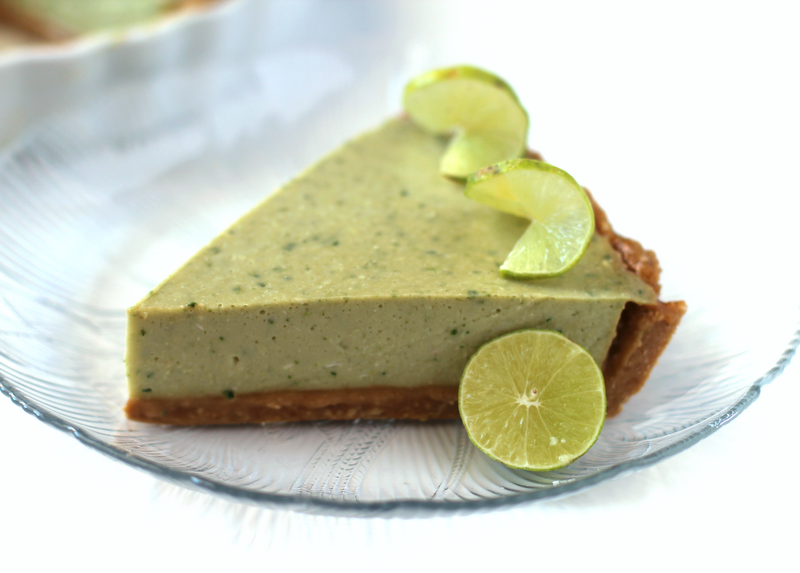 And, if you're like me, then you will love this healthified key lime pie. Can you guess what makes this pie green? Okay, I can't hold it in any longer, it's spinach! Please don't be grossed out, you don't taste it at all! Spinach leaves are kind of like blueberries, the smallest amount will provide ample color in a dish. 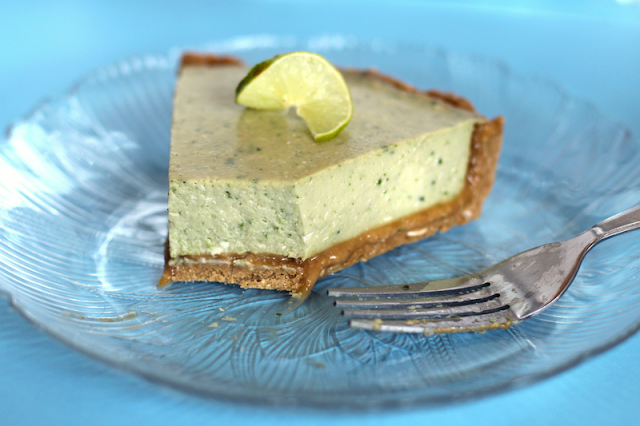 Perfectly smooth and deliciously creamy--other than that, this key lime pie isn't like any other key lime pie. 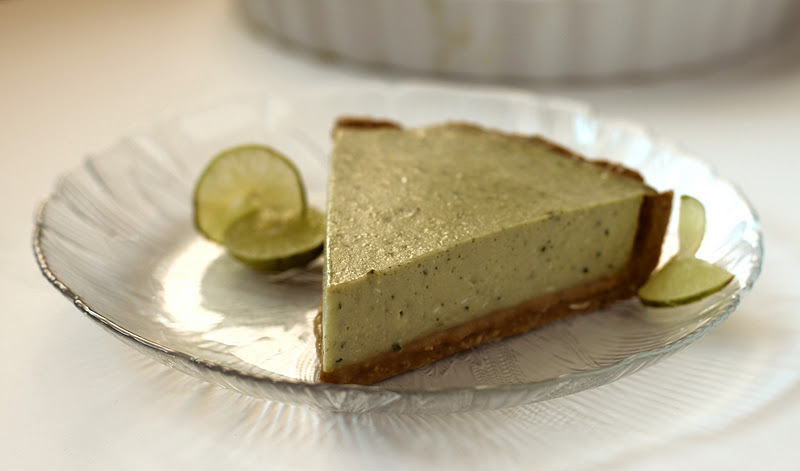 Apart from being sweet and healthy, this pie is airy instead of dense (probably due to the fact that it uses egg whites rather than egg yolks) It has a mild flavor, with coconut and key lime undertones--neither flavor smacks you in the face with an overpowering bite. The filling is like a mixture of mousse, jello, "restaurant" key lime pie, and whipped cream. I usually don't like gelatin in pies, but it wasn't bad in this pie. It wasn't bouncy or jiggly, it was just like a firmer mousse, if you will. It just melts in your mouth! If you are the type of person who likes tart pies, roll the crust a little bit thinner than pictured and you will get more of the key lime flavor rather than graham cracker flavor. What I am really excited about is the "graham cracker" crust, which is made without graham crackers! The texture is like a very soft and moist cookie, or, a harder, dryer cookie dough. There was some leftover after lining the pie pan, so I just reserved it for later (of course). And boy, am I glad I did! It's like eating gingersnap or graham cracker cookie dough! But honestly, this was not a problem for me and my other happy taste-testers! The pie will only separate when accompanied with one fork and a serious appetite (which I apparently had). 1. Blend the oats and sucanat in blender until it becomes a fine flour, put into a large bowl. Stir in the protein powder, cinnamon and salt. 2. Warm the coconut butter, honey and molasses in the microwave at 15-second intervals, stirring in between each one until coconut butter is melted. Pour over the dry ingredients and stir until mixture is even. 4. Spray your deep-dish pie pan (at least 2" deep) with cooking spray and dust with more flour. Place the crust into the pan and press into the edges (reserve any extra dough for snacking). Refrigerate while you make the filling. 1. Put the evaporated milk, spinach and extracts into a blender and process until smooth. Add the coconut sugar, protein powder and salt and blend again. 2. Warm the coconut butter and 2 tbs of the honey in the microwave at 15-second intervals, stirring between each one, until butter is melted. 3. In a large bowl, whip together the cream cheese and microwaved mixture. Whisk in the blender mixture. Refrigerate while you complete the next steps. 4. Put the egg whites into a bowl and the key lime juice in a separate bowl. 5. Add the rest of the honey to a pot and sprinkle with the gelatin. Let sit for a couple minutes. Place over low heat and whisk. Once gelatin has dissolved, add the egg whites. Constantly whisk the mixture, but not vigorously. When mixture becomes thick (took me about 18 minutes) take off the heat. 6. Very slowly, whisk in the heated mixture into the refrigerated mixture. Do not pour it in all at once. Pour this into the pie pan over the crust and refrigerate overnight. The next day, slice and serve. Best eaten the day after overnight refrigeration. If you would like to make a Key Lime Tart as pictured above, you will need three 4.25"x13.75" tart pans and you will need to double the crust recipe (and roll it out lengthwise rather than into a circle). I would call this pie a success, and now I can cross it off my Recipe Wishlist! Wow! What a great way to sneak in veggies! I won't tell anyone if you don't! Hi! You have an interesting approach on the key lime pie here, but reading your recipe I had some queries arise from the back of my mind: how the hell can someone pasteurize egg whites? And stevia extract, could that be skipped or would the result be not-sweet-enough, what do you think? I know it's a sweetener but there's no such thing here, where I live. What a surprise ingredient ... spinach, hmm, never would have guessed that! Thanks for hosting this giveaway! How wonderful! We never would've guessed spinach. Perfect idea. This is beautiful. We love it. Tree Surgeon, I mean take the whites from pasteurized eggs, or just use egg beaters, which is already pasteurized. Also, stevia is very potent and adds a lot of sweetness to the recipe. I wouldn't omit it. You can get two large bottles for a good price on amazon, which is now linked in the recipe. Looks perfect! It reminds me of when I was in Key West, so much pie! 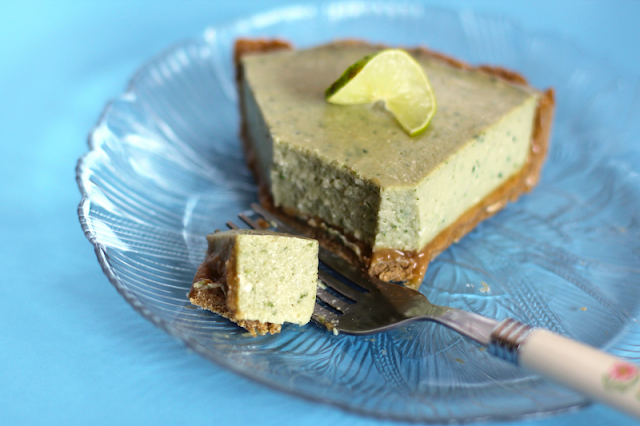 Looks like a tasty healthy version of key lime pie. Would love to win the giveaway! Just thought there may have been some confusion as to which post to comment on to join the giveaway. Go to the linked post at the bottom of the page that says "click link" next to it, and it will bring you to the Apple Cinnamon Butterscotch Cake recipe post. You have to comment on that post to join the giveaway. This sounds delicious, and I am curious, but a little put off by all the "healthy" ingredients I would have to purchase...I guess that would be the price one pays to have their cake and it eat it too. Lisa, if you buy certain items from Amazon.com, in bulk, or on sale, the price shouldn't turn you off to this well-worth-it-pie! You make me want spinach all the time!! !